Until now the Blue Barn Theatre has been like Omaha’s many other small stage companies by operating on a shoestring in makeshift spaces. This grassroots passion project was born of a band of New York drama school transplants afire with the idea of starting their own troupe. Relying more on creativity, charity, thriftiness and ingenuity than real budgets, they mounted plays in rented and borrowed spaces. 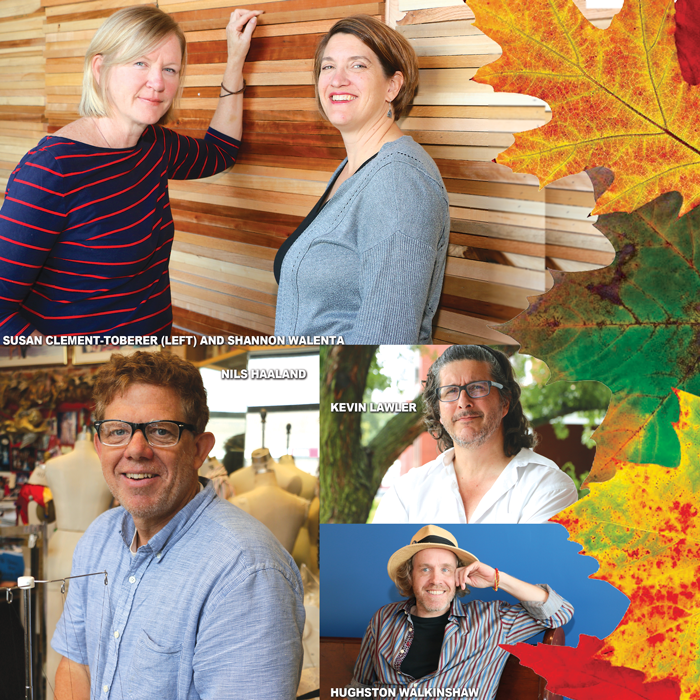 Suddenly, Blue Barn’s done the unthinkable for such a by-the-seat-of-your-pants endeavor by parlaying years of scommunity equity and creative capital to build its own space. It’s Omaha’s first purpose-build independent theater to go up in decades. The arresting new digs at 10th and Pacific are the result of Blue Barn staying the course, remaining true to itself and letting philanthropists catch up to the edgy aesthetic that’s gained it a loyal following. The theater occupied several improvised spaces from its start in 1988, never really securing a place to call its own. It did find stability at the 11th and Jackson Old Market warehouse site where it was housed the last several years. Though hamstrung by cramped quarters not really suited for theater and lacking amenities, Blue Barn made the intimate environment – exposed vents and all – work. Blue Barn personalized it with help from artists designing original posters and custom fixtures. The new theater – part of a mixed used site with residential units, a restaurant and a public garden – features enlarged, upgraded facilities and a flex indoor-outdoor space opening onto the garden. As an ode to its name, the exterior evokes a hand-raised barn via weathered steel walls framed by rebar poles and the roof’s pitched gables. The interior captures the old Blue Barn in hand-crafted floor and wall elements. The theater seats are from the former site. The way the audience enters the auditorium follows the flow of the old space. Splashes of blue recur throughout. The new theater is the culmination of a vision shared by original Blue Barners’ Kevin Lawler, Hughston Walkinshaw, Nils Haaland and Mary Theresa Green. Some took turns at the helm. Each moved on, though never breaking ties. All but Green attended the SUNY-Purchase theater school. Her then-marriage to Lawler brought her into the fold. As the legend goes, Lawler was visiting Omaha when Old Market denizens embraced his theater dream and offered space to realize it in. He got Walkinshaw and Haaland to come join him. Clement-Toberer arrived a year later. She’s now led Blue Barn longer than anyone. The group’s deep, familiar kinship was evident one August morning at the new space. Emotions ran high during a tour and roundtable discussion. All agree the site fulfills what they once only dared imagine. “Every dream we’ve had in our entire existence is embodied in this building and we can keep dreaming,” Walkinshaw said. Realizing that dream has been replete with challenges, including one space that burned down and people who burned-out. “It’s been a road,” Clement-Toberer said. Keeping it going meant digging into personal finances. They say it’s all been worth it, given how far Blue Barn’s come. “There were times we were homeless and there were times where there was a real chance the theater wasn’t even going to survive.,” Walkinshaw said. “Now it has, and I’ll tell you what, I breathe a lot easier, I don’t have to worry about the Blue Barn sustaining. I feel relieved now – like the Blue Barn way will continue now permanentlyand all the sacrifices we made and the passion we gave now will live. The Blue Barn’s long been a darling of Omaha tastemakers, with the likes of Alexander Payne among its fan-support base. But it only recently got corporate sponsors such as Omaha Steaks and donors such as developer-philanthropist Nancy Mammel to buy in. Despite many lean years the theater gained enough credibility to launch a capital campaign to fund construction of the new site as well as raise funds for an operating budget and endowment. 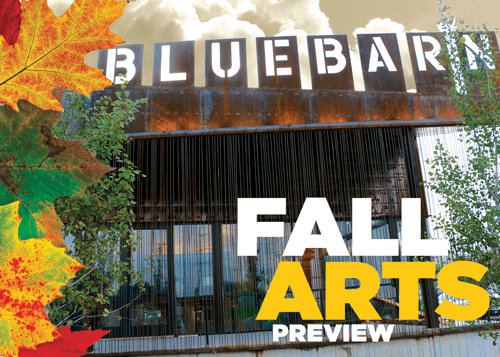 Clement-Toberer said that in the process of Blue Barn gaining its first permanent home her main concern was maintaining the theater’s funky, grassroots identity and intimate relationship with patrons. “The biggest struggle for this building in creating our home has been to keep the Blue Barn voice clear and pure to who we are and to how we create theater. Everybody thinks they know what a theater should be and how we should produce theater. Even with this major transition of moving into our own space there have been times where people say, ‘But that’s not how you do that in theater, you need to do it this way.’ Well, we don’t have to do it that way. Mary Theresa Green said the Blue Barn way is a process born of freedom, exploration and seizing inspiration where you find it, whether repurposing materials or calling in favors for props and set pieces. “To me, it means producing something very organically and from a place of love and hope,” Green said. “Like the found objects and somebody who just happens to know somebody who has free things we can use and put together. Because everyone is so creative and imaginative and free and almost very childlike in creating the pieces, they become these deeply beautiful shows that really affect and touch people, way beyond just basic entertainment. Lawler, now Great Plains Theatre Conference producing artistic director, described Blue Barn’s guiding ethos. “There’s a certain type of show I think we all just loved when we saw it and if I had to put it into words, it’s like what any great work of art will do when you see it or partake in it, you walk away from it being cracked open as a person and looking at and feeling the world differently. Even if it’s an incremental amount of growth, it happens, and it’s very distinct. You can ask all of us and we all knew then this is what we wanted to facilitate with every show we put up. “It’s like, we don’t have any money, all we have is ourselves, but somehow we’re going to get to the heart of this story so deeply it will facilitate this experience of opening up a compassion, and the people who come and share in the story will have that experience. That to me has been the seed of the whole thing from the beginning. “And then all this has happened around it,” Lawler said. Clement-Toberer, who with managing director Shannon Walenta built the theater’s business side to balance the artistic side, believes she knows why the community’s repeatedly come through with support. “I think it’s pretty simple – it’s our mission. What we do on stage has not changed over the years. Matured a little bit, which I think is good. But I think it’s the stories we tell and the way we produce theater. And the way we built this theater is the way we also produce theater – the Blue Barn way, which is found objects that become magnificent and sets we build at cost but create a great vessel to tell a story. Our budget’s a little higher but I’m still digging through dumpsters. She found the right interpreters to articulate these things in the building in Joshua Dachs from New York-based international theater space planning and consulting firm Fisher Dachs and in architect Jeff Day of the Omaha and San Francisco-based architectural firm MinDay. “I think she sensed I would understand where she was coming from, which I did,” Dachs said. “When I visited the Blue Barn it was clear it’s a kind of artisanal handmade theater company. The old space had amazing show posters designed by artist friends – beautiful woodcuts and lino-prints – as well as handmade ceramics by Susan’s husband (Dan Toberer) and a hand-carved wood counter by an artist friend. The very things bound up in Blue Barn drew Dachs to the project. Dachs admires the uncompromising stand Clement-Toberer’s taken to stay true to Blue Barn and not go for the slick or the inflated, like the 300-seat theater some pressured her to pursue. The new theater accommodates about the same number of patrons, 96, as before. Architect Jeff Day said, “There was a very strict sense of budget, so we knew from the very beginning how much they could spend on the building, and Susan was really on top of things to make sure this was achievable. We had to cut things out here and there. She was willing to make sacrifices on things they don’t really need. Just as Dachs did, Day found the project appealing because of how the theater does things. “Blue Barn likes to think of itself as experimental and challenging,” Day said. “They’re not afraid of doing edgier things that might shock people or cause people to think. Obviously for an architect that’s exciting because it sort of gives us justification to do things that are unfamiliar as well, which we love to do. Many ways were found to give the new site the handmade qualities that distinguished the previous venue. Since collaboration is a hallmark of the company, the theater commissioned artists in different media to contribute their talents. The heavy timbers used in the new theater’s eight columns were salvaged and milled by Dan Toberer, a ceramist who collects felled trees and sawmill scraps he variously repurposes or uses in his wood-fired kiln. “We identified different elements that could be turned over to artists and they weren’t working necessarily under our direction,” Day said. Toberer also created original ceramic pieces and built the sinks in the bathrooms. He also sourced scrap wood that contractors used to clad the theater box in. Omaha artist Michael Morgan did a piece of the lobby and vestibule in dark grey bricks with blue glazing. Kris Kemp from the Hot Shops fabricated the enormous rear door that opens onto the green space. Jim Woodhill of Kansas City, Mo. did lighting elements and furniture. For Day, everything works together to create a mystique. He said the theater’s been designed with the eclectic character of its delightfully messy residential-commercial surroundings in mind. Much thought was put into the theater’s setting since it’s now part of a robust South 10th Corridor with the Old Market, the Durham Museum, the House of Loom, KETV, Little Italy, Cascio’s. No More Empty Cups and the Bancroft Street Market. Vic Gutman’s coming Omaha Market will be just to the south of the Blue Barn-Boxcar complex. Even with the new theater, Clement-Toberer’s wish list is not quite complete where the Blue Barn’s concerned. She said the family-like dynamic she and the founders used to fire their work together is something she’d like to recapture there. Blue Barn opens its 27th season on Sept. 24 with The Grown-Up. For details and tickets, visit www.bluebarn.org. Straight Outta Omaha: The Origin of DesaparecidosJust Can It!